PROFESSIONALLY: Spent his entire professional career playing internationally…Last season, averaged 10.7 points and 4.3 assists while shooting.439 from three-point range in 43 games for Barcelona in the ACB League (Spain) and tallied 9.0 points and 4.2 assists in 29 games of Euroleague action…In 2014-15, averaged 8.1 points and 3.3 assists while shooting .432 from three-point range in 68 combined games between ACB and Euroleague play for Barcelona…After being drafted by the Wizards, participated 2012 Las Vegas Summer League…Appeared in five games (no starts) and averaged 4.4 points and 1.8 assists…Recorded a personal best 11 points off the bench in the Wizards 76-70 win vs. Houston…Later that season when on to play two seasons for Sevilla in Spain (2012-14). Prior to being drafted by Washington, he played three pro seasons (2009-10 through 2011-12) in Spain (for Qalat Caja Sol Sevilla and Cajasol Sevilla) and two pro seasons (2007-08 & 2008-09) in his native Czech Republic (for USK Prague). 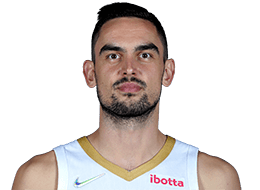 PERSONAL: Satoransky is from Prague, Czech Republic and is a member of the Czech Republic National Team.